Friday, March 2nd was marked by record high winds for much of the state. Residents experienced wind speeds of 30 to 45 mph and gusts well into the 70 mph range. Some counties closed schools, MARC train services were suspended and thousands were left without power. 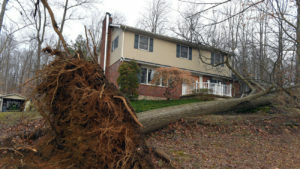 With such a severe storm, it is no surprise that many homes in the area have been damaged by the gusts. What to do if you have wind damage? If you see missing shingles in your yard, loose shingles on your roof or siding pieces that have come loose, you should file a storm damage claim with your insurance company. With a storm of this magnitude, your insurance company will be backlogged with claims and the sooner you get your claim in, the sooner they will be able to send an adjuster out to assess damage. While you wait for an adjuster to come out, your insurance company may recommend you go ahead and call several contractors to gather repair estimates. We recommend you take this step right after you place your claim as contractors will also become backlogged with work. When you speak with contractors, you’ll want to limit your search to those who primarily deal with insurance work. Retail contractors do not have the experience to properly handle insurance repairs. You want a knowledgeable contractor to ensure your insurance pays for everything you are entitled to like building code upgrades, matching, entire roofs and not partial slopes. Most homeowners have never placed an insurance claim for storm damage and the process is completely new to them. Modern specializes in insurance work and has for over 27-years. We can guide you through the process at no charge and we’ll even inspect your home for damage at no cost. Call or contact us with any questions, big or small. We are a here to help!